Some celebrities like John Mayer rock the DQM Nike Blazer while on concert. Jumping around on stage comfortably in the popular Nike Shoes. Other’s like Manny Paqiaou, who recently pummeled Cotto in a 12 round rought, have their own shoe made for them. For general comfort, running, cross training and other everyday activities, the Nike Frees seem to be very popular among celebrities. 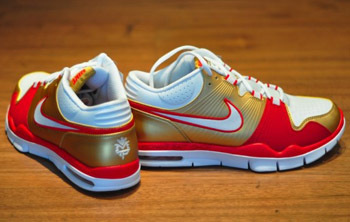 Below you’ll find images of Ashton Kutcher and Reality TV Star Kim Kardashian rocking the Nike Frees. The most popular shoe seems to be Nike Free 5.0 V4. The Nike Frees seem to be the shoe of choice for casual wear. They do feel light and wear similarly to slippers. But why are the 5.0’s more comfortable than the Nike Free Everyday shoes if the Nike Free “Everyday Shoes” are made for everyday wear. The bottoms of the Nike Free 5.0s bend a lot more than the Nike Free Everyday shoes, because of this they feel a bit closer like walking barefoot. Compared to the Vibram Five Fingers shoes, the Nike Free shoes are definitely more popular because of their stylish and clean look. These 2 brands of shoe are different beasts, but if you do want to compare them, we have a good comparison of the Nike Free versus the Vibram FiveFingers shoes right here. Some of our users who run regularly in the Nike Free shoes reported that the nike free, although very comfortable arent suited for preparation for running barefoot. Here is a video that shows the comparison of running barefoot and with the Nike Frees. We welcome more feedback about what our users thing about the Nike Frees. If interested in leaving your input, feel free to leave them on a particular shoe like the Nike Free 5.0s.